One of the Tasglann projects roles is to provide training and support to the Comainn Eachdraidh. In April we spent two evenings working with North Tolsta Historical Society offering training and advice on the cataloguing of the archives they hold relating to the area. Split over two weeks, David, Donna and Katie Anne lead two 2-hour activity-lead sessions looking at the purpose of cataloguing, archival arrangement and describing archives. Most importantly of all everyone having a go at cataloguing some of the records they care for so well. 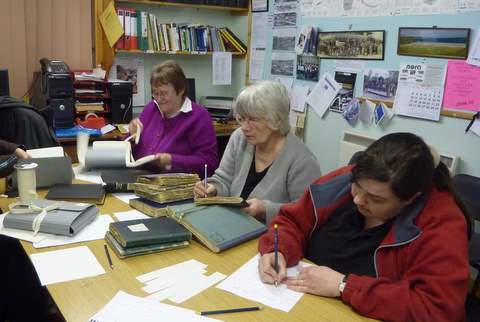 Members of Tolsta Historical Society eagerly cataloguing! Collections including records relating to Katie Anne’s old school, Tolsta Primary, a collection of letters written to Donald MacDonald from Tolsta emigrants who moved to North America and scrap books of press cuttings and news articles relating to the local area. In all, the cataloguing of four collections was begun and we’ll be paying them a visit in the near future to give them some on-going support in completing the job! This entry was posted in Uncategorized and tagged cataloguing, North Tolsta Historical Society, Training. Bookmark the permalink.